R-Quest has published a end of support notice . Just like many of the other manufactures in the industry. This will not leave you out in the cold and no where to turn for repairs. We are here to help you in getting your system back online. If your unit is listed we can help you in getting your system back up and running at a reasonable cost. CD and DVD Duplicator repair services for most major systems manufactures. Our technicians have extensive training and experience, using and repairing CD/DVD duplicators for the past 20 years. 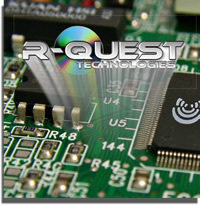 The brands we focus on are: R-Quest Technologies, Global DiscWare. Is your duplication system out of warranty and no longer working? If so Controlled Copy Support Systems Inc. (CCSS) can help. We have inventory of new, used and obsolete parts and systems. If having your system repaired at a relatively low cost would help your production and bottom line --- why not call us now 703.433.0050. CCSS charges a $85.00 diagnose fee. We will contact you with a estimate for the repair charges. If you choose to go ahead with the repairs, the $85.00 diagnose fee is applied to your bill. If not, we simply charge the $85.00 fee and send your system back. Shipping in the original box is NOT required*. Yes, if you have the box, please use it, but safe and secure packing is really all that is required -- as well as insurance on the shipment. All repair service is warranted for 30 days. Customer is responsible for all shipping costs, even if machine is to be returned without the repairs being completed. Return shipping will always be insured for a minimum of the repair costs.